This week, we are happy to feature Author Traci Leigh Taylor. We met Traci at the Northwest Book Festival in July. Traci’s book, Voices from the Rainbow, is a collection of LGBTQ stories, both personal and poignant, written with care for each person featured in the book. We hope you’ll enjoy learning a bit more about Traci and her book. Please tell us about you and your book. My name is Traci Leigh Taylor and I live in my home state of Oregon with my husband, two dogs and a cat. I have four grown children and seven grandchildren. I love writing, gardening, photography and feeding the wide range of birds that visit our home. 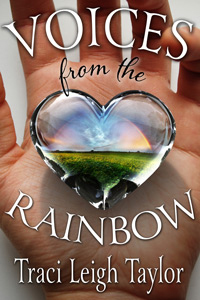 In October of 2014 I published my first book, Voices from the Rainbow. In 1996 my son, Daniel came out at the age of 15 and I was thrust into a whole new world that I wanted to understand. Soon my home became a safe place for his gay and lesbian friends. In 2009 Daniel was touring Gay and Lesbian film festivals with the Movie, The Big Gay Musical. While in front of a Washington, D.C. audience he was asked if his mom minded that he was in a gay movie. He told them not only did his mom not mind, she was writing an LGBTQ book. He called me that evening to tell me that I needed to get on with my dream and write that book. I had been writing since I was 14 but had rarely shared my poems or short stories and this was the boost I needed. With my son’s encouragement I read his letters and diaries that were stored in the attic of our barn. After that Daniel gave me the names of several of his friends to interview. A few months later Daniel posted on Facebook and Twitter to write his mom with their story. Each person that shared with me opened a door to another person and another story. These stories touched me deeply and became my driving force to have their voices heard. Over 50 LGBTQ people from all over the U.S. and other counties shared their stories with me. Even though we have come a long way in the last few years there are still many LGBTQ people who struggle with acceptance. I have received many emails telling me that reading these stories has helped them to not feel alone and is helping them to heal. It has also opened the hearts and minds of people who have friends and family that are LGBTQ and promoted understanding. How would you say your book is different from other LGBTQ books on the market? There are many LGBTQ fiction books on the market and some non-fiction individual stories but Voices from the Rainbow covers a variety of LGBTQ stories from of a wide range of ages. Are you planning more writing projects and if so, will you stick with the same theme? I am just starting to work on my next book which is LGBTQ people over 65. In 1967 When I was a senior in high school in Eugene Oregon I didn’t even know what the words gay, lesbian, homosexual meant. Recently I found out that the girl I sat next to in drama class is a lesbian. My next door neighbor when I was growing up is gay. My best friend in high school is married to a cross dresser who is very active in LGBTQ organizations around Portland and now they are both my good friends. If these people could have looked into the future in 1967 and seen 2015 with hundreds of thousands of people all over the U.S. marching in Pride parades and Equal Marriage being passed what would have they thought? What are their stories? What changes have they seen and what changes do they hope to see. Many have lived secret lives that most of us can’t even imagine. I want to hear those stories and share them with others I want to start interviewing LGBTQ Seniors for my next book very soon. And finally, what advice would you give to first time authors? My advice to new authors, take writing classes, join a writers group but most of all keep writing and don’t give up on your dream. You can find Traci on her blog, http://www.mommatraci.com or email her at m@mommatraci.com. Her book is available for purchase on Amazon. We’d like to thank Momma Traci for taking the time to talk to us. Have a great week everyone! 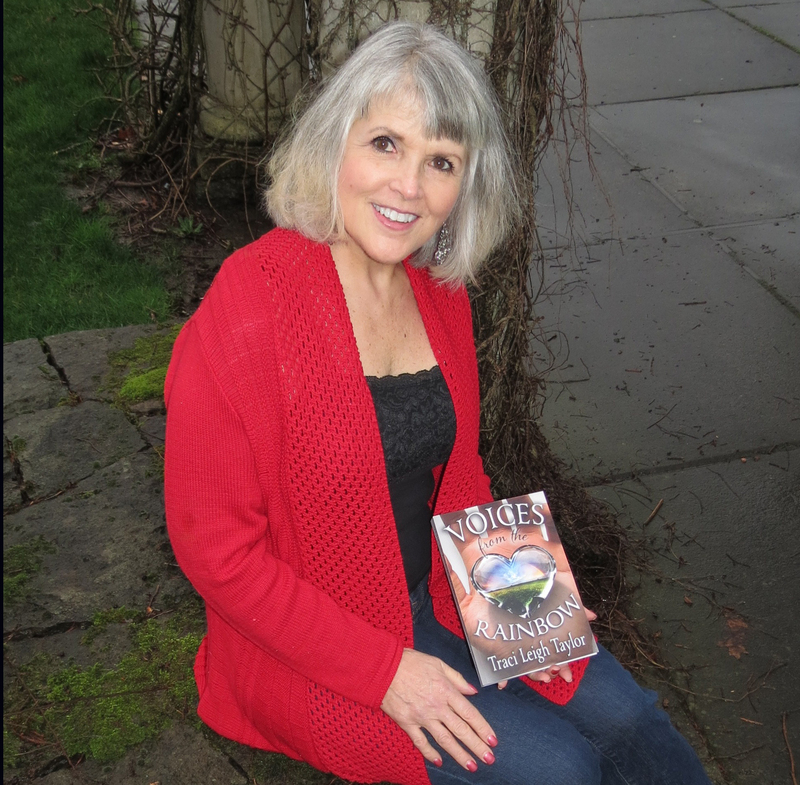 This entry was posted in Uncategorized and tagged author interview, book promotion, guest author interview, LGBTQ Stories, Litzophreniacs3, Northwest Book Festival, Renna Olsen, self-marketing, self-publishing, Traci Leigh Taylor, Voices from the Rainbow, writing collaboration. Bookmark the permalink.